I am guessing that Sarah B from My New Roots hardly needs any introduction? She is one of the most inspiring voices on the plant-based recipe scene, always with a smile and a smoothie on hand. 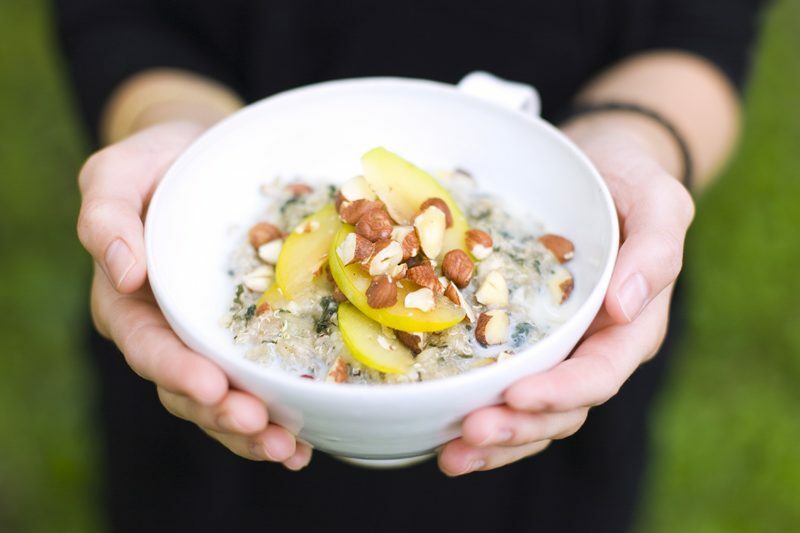 Her way of reinventing traditional dishes into healthier versions of themselves is downright amazing. And if that wasn’t enough, she is one of the nicest and most positive persons we have met. Her long awaited cookbook has the same concept as the blog, but is printed on beautiful paper and with the recipes divided into seasons (five of them!). There are plenty of inspiration for all flavours here and we have lots of dog-eared recipes yet to try. If you enjoy our type of cooking, you are going to love this book. It’s a gem. I am not sure why we chose to feature this exact recipe, a more colourful one would probably be more representative for the book. I guess we were intrigued by the thought of eating giant shaped cookies for breakfast. The fact that they are vegan and had a can of white beans in them, probably also sparked our curiosity. 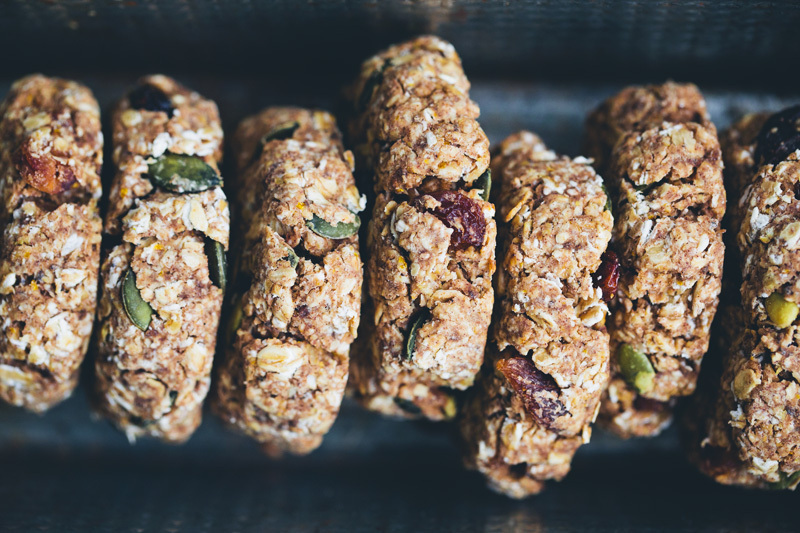 Sarah writes that its time to ditch the plastic packaged breakfast bars as they are filled with too much stuff that doesn’t do us any favours. 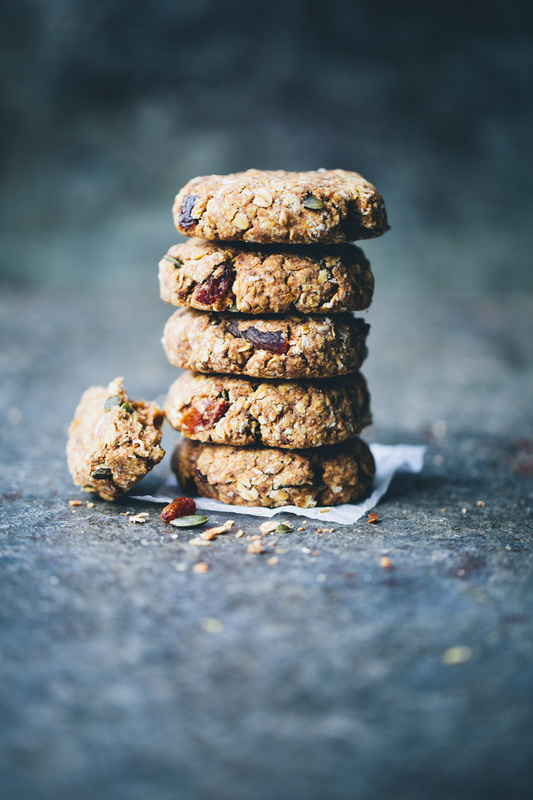 Her bars (or cookies) are loaded with whole-food fiber, protein, healthy fats, real fruit, and as we mentioned above, even beans. We have already made these quite a few times. They taste really delicious with a hint of orange. Even though they seemed a little crumbly to us at first, they held together very well when baked. We find them perfect to make for a pantry cleaning, as almost any kind of nuts, seeds and dried fruit can be added. We also made one version where we subbed the maple syrup with a ripe banana and two dates. Baby Isac loves them too, and since they are filled with so much good stuff, we love making them for him. Preheat the oven to 350°F / 180°C. Line a baking sheet with parchment paper and set it aside. 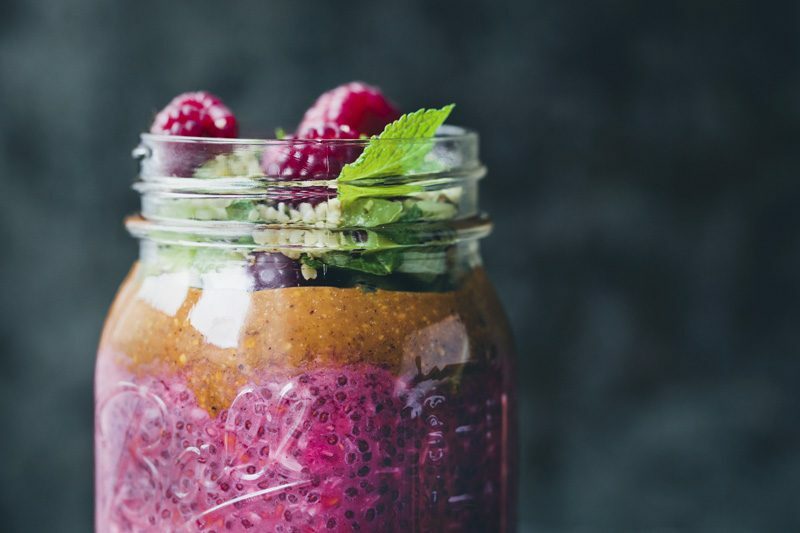 Combine the chia seeds with 3 tablespoons water in a small bowl, and set aside for 15 minutes to gel. Pulse 1 1⁄4 cups / 125 g of the oats in a food processor until they resemble a very rough flour. Transfer the flour to a large mixing bowl and whisk in the remaining 2 cups / 200 g oats, baking powder, baking soda, cinnamon, and salt. Pulse the beans with the coconut oil in the food processor until the mixture is creamy. Add the maple syrup, orange zest, chia gel, applesauce, and vanilla extract, and pulse until smooth. Pour the bean puree over the oats mixture and stir until everything starts to come together. Add the apricots, raisins, pumpkin seeds, and cornflakes and stir to combine—you may need to use your hands at this point. Shape the dough into 10 equal balls, and then flatten each one into a patty shape. Transfer them to the prepared baking sheet. Bake for 15 to 18 minutes, until the bars are golden. Let cool completely before enjoying. The bars can be stored in an airtight container at room temperature for 1 week, or in the freezer for up to 1 month. PS! We are coming to London last weekend of September for two different events. We will be talking at the Food Blogger Connect conference at Chiswick House on Friday 25th and Saturday 26th September. 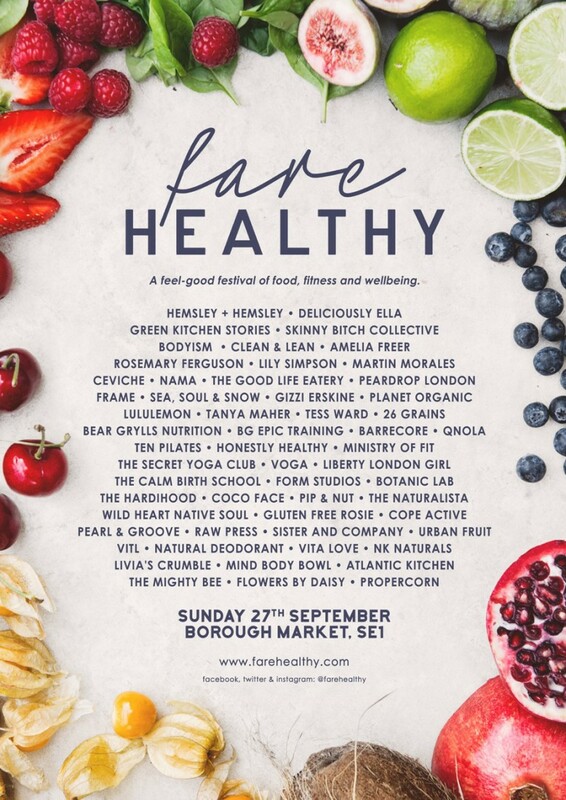 We are also excited to be talking and cooking at the Fare Healthy festival at Borough Market on Sunday 27th September. Check out their websites for tickets and more info. I have been eyeing these cookies in Sarah's book ever since purchasing a few weeks ago. 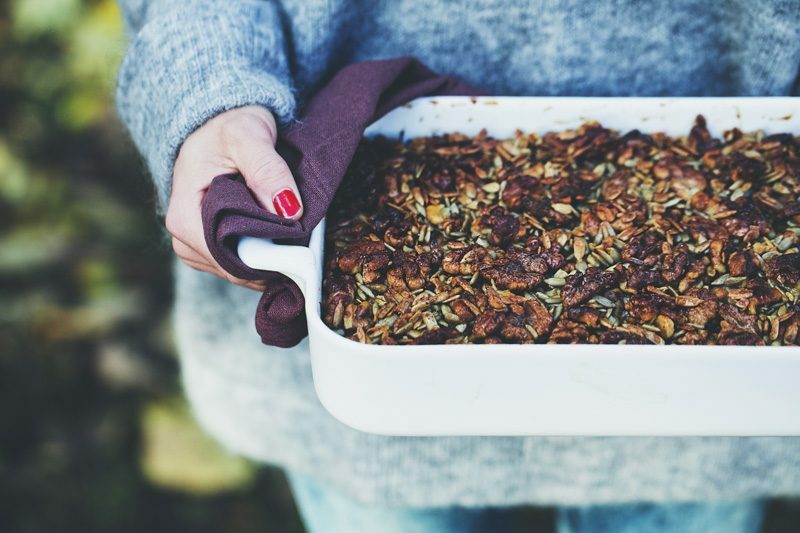 I love how versatile this is and that it can accommodate any nuts, seeds, and dried fruit on hand. Perfect breakfast to take on the go. Thanks for sharing a recipe from one of the most positively creative and inspiring bloggers out there (aside from you guys of course!). The 2 cups of cornflakes are optional? Should I replace them with another dry ingredient? I also wondered about this - particularly at the point where, having planned poorly, I only noticed it in the list at the end of doing the steps. My mixture was quite wet in a sticky way, as opposed to watery wet. I added 4 heaped teaspoons of LSA and this helped with the consistency. They have baked and turned out very fine :o) All the same, I'd love to hear any feedback from David or Luise please! These look very interesting! 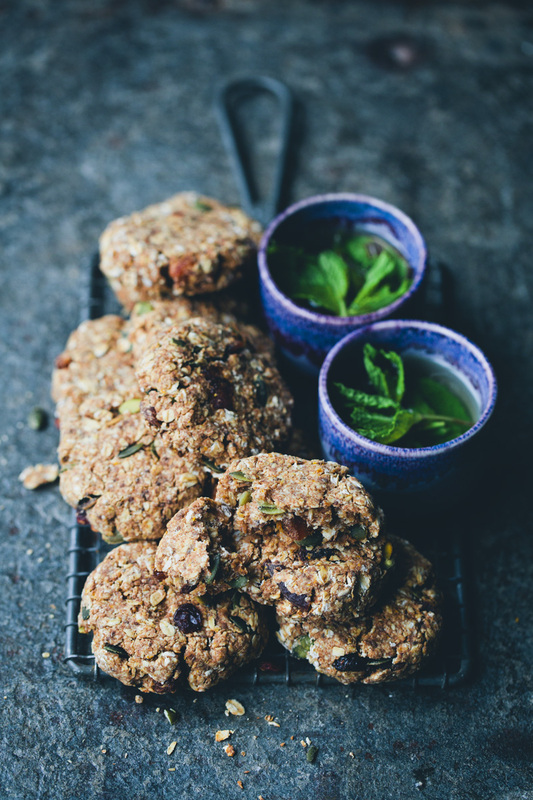 Definitely going to look into making these, look like the perfect, healthy and on the go breakfast! I am rarely attracted by a cookies recipe, but this time your pictures are so good that I want to make them now. Thank you! Natron (at least that what it is in Norway). Could you use olive or grapeseed oil in this rather than coconut oil? I've developed a couple of nut allergies recently so I try not to have too much coconut often just to be safe. Fantastic idea! It's great to know exactly what you're putting into your body. I'm going to have to give this a go this weekend..
Beautiful and delicious-looking cookie bars! 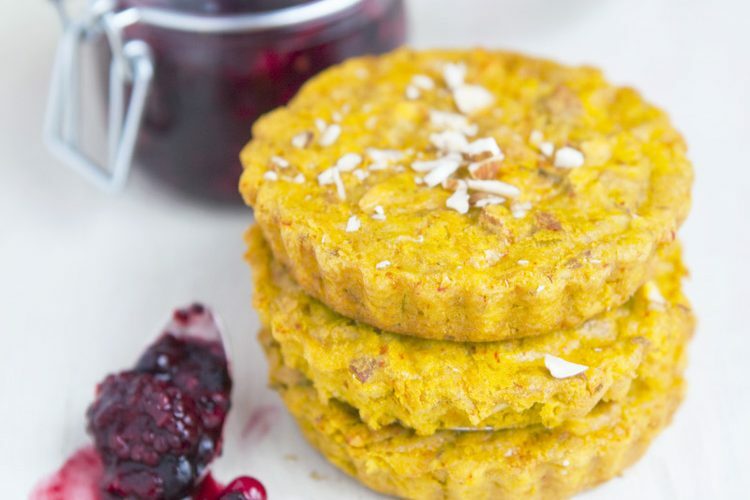 They would make an incredible tasting treat, breakfast or snack! I own her book and, yes, these are fantastic! The whole book is, actually. I *may* be going to the Fare Healthy festival. It'd be great to see you there! This looks so delicious! 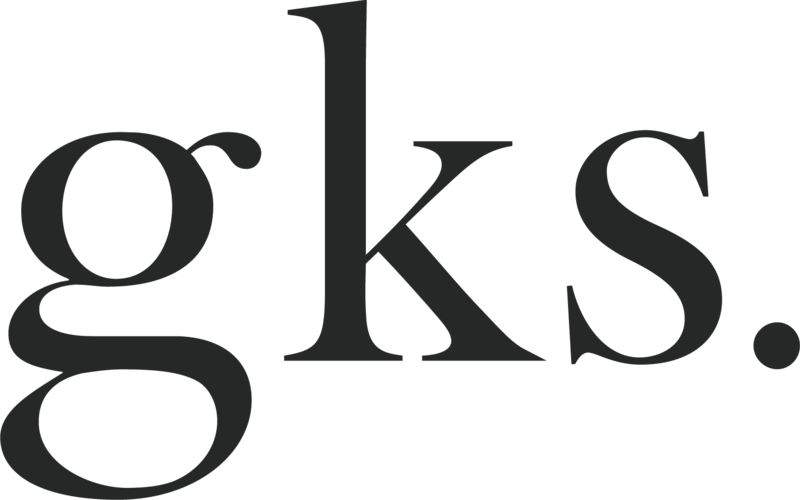 I have never checked out My new roots blog and am anxious to dig into it more but I just wanted to let you know the link to their blog is going to .com when they are .org. ;) thanks for all of the fabulous info you share. It is super inspiring! I bought this book a few months ago and I absolutely love it! 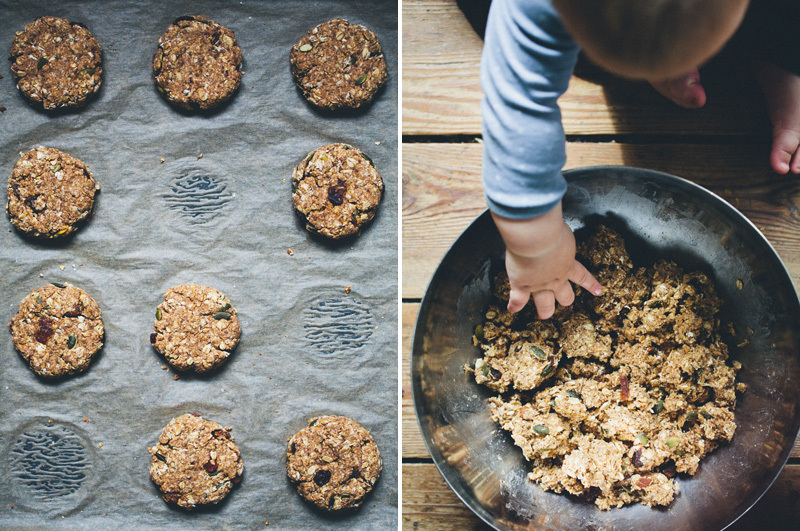 So great to hear baby Isac is loving healthy food too! Have a nice Sunday!